Brian Kossman teaches soil health. Luke Adams teaches soil health on a cover crop field tour. Robert Giesbrecht will speak at the Soil Health Workshop on Feb. 6. BURLEY — Three southern Idaho farmers will share their experiences on soil improvement activities at the fifth annual Soil Health Workshop to be held Feb. 6 in Burley. Brian Kossman will speak at the workshop about the Direct Seed and Cover Crop Project which provides education and resources to farmers working to improve soil health. Kossman raises sugar beets, beans, barley, corn and alfalfa on 200 acres. His approach to conservation is saving water using no-till practices for water penetration, preventing soil erosion and improving organic matter for soil health. Kossman also serves as farm manager for Schaeffer Farms where he implements many innovative practices. He is currently chairman of the Minidoka Soil and Water Conservation District. In 2013, Kossman was named a Cooperator of the Year by the conservation district, and in 2016 he was made an honorary member of the Minico FFA. The Food Producers of Idaho spotlighted Brian and Gretchen Kossman as a Featured Farm Family during the 2017 Twin Falls County Fair. 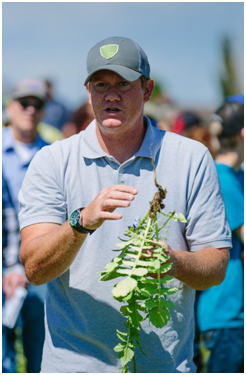 Luke Adams will share his knowledge about cover crops at the workshop, discussing successes and failures involved in his efforts to improve soil health on his farm. After graduating from Utah State University with a degree in economics, Adams began a career as a civilian procurement officer for the U.S Air Force. After completing his masters in business administration in 2010, he and his wife Sara decided to return to the family farm where they now raise sugar beets, malt barley, wheat, corn, potatoes and alfalfa with a focus on sustainability and soil health. The Adams’ efforts were recognized as the 2016 Minidoka Soil and Water Conservation District Conservation Steward of the Year. They also run a seed business, AgriTerre Seed, which focuses on providing value-added cover crop blends and forages. Robert Giesbrecht will speak at the workshop about the benefits of fewer tillage passes and specialized cover crops. Giesbrecht is the owner of R-Farms and founder/owner of Pillar Butte Seed — both based in Aberdeen where he currently lives. In 1998, Giesbrecht started selling sugar beet seed for ACH Seeds where he discovered radish cover crops. He began using radish on every acre possible, regardless of future crop. In 2002, Giesbrecht started Pillar Butte Seed which specializes in cover crops and working with growers to create blends that work. His number one goal was to eliminate tillage passes as he does not like driving tractor. Additionally, the soil improvement led to many other benefits that accompany fewer tillage passes and cover crop usage: improved yields, less water and fewer inputs. To register or for information about the workshop, call 208-572-3369 or email ewcswcd@gmail.com.